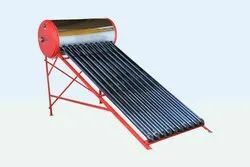 Offering you a complete choice of products which include stainless steel solar water heater, 60 lit stainless steel wood fired water heater, commercial wood fired water heater, wood fired water heater, 100 lpd solar water heater etc model and wood fired pool heater. Better performance in winter and cloudy days. No scale formation will occur by using salt & hard water. Compressed PUF insulated storage tank to retain the hot water for more than 48 hrs. Inner tank made of SUS 316L grade surgical steel used in marine applications. Suitable for bore well water and hard water usage. All fasteners are made of SUS 304 food grade for rust free. 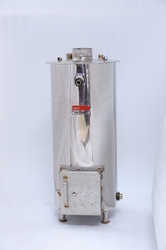 Auxiliary tank is fitted instead of air vent, withstands high pressure of cold water. Pressure also minimize mixing of hot & cold water. ISI maked 1.5 back-up heater with Thermostat (Optional). Completed 6 years of service with satisfied customers globally. Replacement warranty. Free service & minimum product life span of 25-30 yrs. 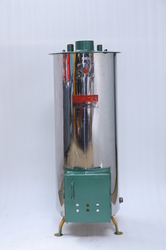 We are offering Stainless Steel Wood Fired Water Heater. 1 Unit includes: Firelit Water Heater, a fire grate, an ash cleaning rod, center pipe cleaning rod, a chimney pipe holding stand, a temperature meter and a safety valve. We are offering Commercial Wood Fired Water Heater. Saves fuel to the maximum. Suitable For Homes, Lodges Hotels Hostels Industries Canteens Poultries Pools Places where hot water is used. Firelit water heaters cut off your electricity bill and work with very less quantity of industrial and agricultural wastes. 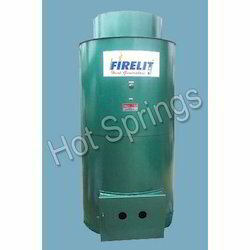 Firelit is a storage type water heater and it provides a wide range of capacities starting from 40 liters to 1000 liters. Firelit gives a 2 year warranty for domestic and non-domestic units and the unit has durability up to 15 years. Firelit Water can be supplied to the upper floors. It requires only less space for installing (minimum 1 sq.feet and maximum 5 sq.feet). The furnace is constructed to hold enough fuel and it is designed in such a way that the water gets heated in very less time. Hence it consumes less fuel and supplies hot water in no time. The storage area is coated with a corrosion resistant, a high-temperature coating that prevents the unit from giving rusty water hence gives sturdy and hygienic water. 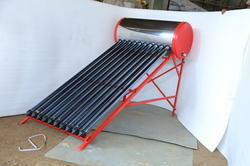 e are offering Solar Water Heater. Hot water available in 1.5 hours. Air vent is not needed as an auxiliary tank is fitted instead of air vent, withstands high pressure of cold water. Firelit Pool heating system is the cheapest way of heating the pool with the help of waste firewood which is found to be the real success. The working principle is very simple where any pool is connected with this unit at great ease. Just in half an hour, the whole pool gets heated up with minimal usage of firewood waste.